England has some seriously weird kids’ shows. No, I mean seriously. And by “weird,” I mean their opinion of what kids can handle in their television is far different to what we Colonials think we can get away with. Look at things like “The Sarah Jane Adventures.” They really have no problem freaking children out or assuming they have brains. So knowing that the sons and daughters of England had a show like “Raven” in 1977 really shouldn’t surprise me. From the man who directed the Doctor Who story “The Space Pirates” and the mind that brought us “The Avengers” comes the story of Raven, a juvenile delinquent sent out to live for a month under the care of a dotty old archaeologist. Said archaeologist is currently studying a series of caves believed to be inhabited and used during the time of King Arthur. However, by Professor Young’s reckoning, “Arthur” wasn’t so much a name as a title given to great leaders born during times of trouble. And as the time of this series is particularly troubled for Young, he believes the next Arthur is somewhere near — perhaps, say, the orphaned delinquent named after the bird guarding him when he was found as a baby. Raven is, as all Chosen Ones are, at first disbelieving and then reluctant. Even after repeated strange visions and the occasional blatant visual juxtapositions of Young and his taxidermied merlin falcon, Raven has a hard time believing that a troubled teen such as himself could have any sort of importance. When he finally ventures down into the caves himself he begins to see the light, but still has no desire to carry that sort of burden of responsibility. But when crisis finally strikes, he answers his call to duty, rallying a brave army to bring peace and justice to the small town in which he currently resides. What’s the crisis? The cave system has been earmarked as a disposal area for nuclear waste. And the only one who can stop it happening is the reincarnation of King Arthur. “Raven” is, overall, a well-intentioned series with an environmental message aimed at the youth of Britain. And it addresses fairly clearly the concern about preservation of British historical landmarks — albeit being rather on the sarky side concerning what they assume to be the worldview of the UK. Unfortunately, it does sort of go to “Captain Planet” depths of super-serialness to get its point across. To that end, the Arthurian theme seems a bit forced, and over the course of the six episodes goes from curious to unnecessary to a bit clumsy. A pity, as the general concept that’s introduced in the first episode is an interesting one. In the end, the only true Arthuriana you get is Raven in dress-up trunk regalia and a frankly terrifying wig. One of the big reasons to dig this out for a watch is the chance to see “EastEnders” star Phil Daniels in an early — very early (he was 19) — role. The late Michael Aldridge (of “Last of the Summer Wine” and the BBC adaptation of “The Lion, the Witch, and the Wardrobe”) gets some good screen time as Professor Young, and it’s a pity to see his character wasn’t explored any further. Another “EastEnders” star, Shirley Cheriton, plays Naomi, a young idealistic reporter whom Raven fancies and doesn’t get far with because, well, he’s a teenager. “Raven” is a short watch, and thus no waste of time if you’ve got an eye for British children’s programming. As a show, it’s really quite entertaining provided you don’t actually think about it too hard. If you’re an Arthurian geek looking to have your fandom fed, you’ll be left high and dry around the middle of the series. Either way, the show has a satisfactory — if not kind of bizarre — ending. Overall, it’s a good watch as a bit of nostalgia and a curiosity, provided you don’t have particularly high expectations of it. 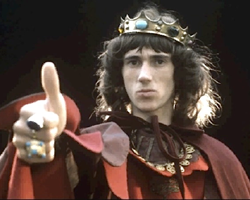 In: Columns, Television: British and Canadian · Tagged with: arthurian, no R1 for you, oh my god they look so young, phil daniels, this is for children?, what did I just watch?